The port of Riga, the capital of Latvia, saw a 19% jump in tourism in July 2010 compared to the figures from July 2009. Royal Caribbean's Vision of the Seas made her first stop there and with it, brought to Latvia's capital more than 2 thousand passengers. With these figures, the city bureau of tourism, Maxim Tolstoy, intends to maximize the flow of tourists for next season. Most of the tourists that visited Riga were tourists from Sweden, USA, UK, Germany and Norway. Riga, and Latvia in general, is still an outsider in terms of tourism among its fellow Baltic countries. 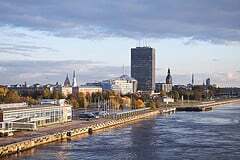 Riga spends 2.1 million Euros on tourism, which is dwarfed by the city of Tallinn that spends four times that and the city of Vilnius three times that figure.